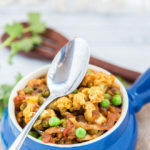 Easy Aloo Matar – spicy potato and green peas curry. Best enjoyed with plain rice or any Indian bread. More often that not, the easiest recipes fail to make it to the blog. At least that’s true for all my Indian recipes. So today for a change I thought of sharing with you guys a very simple Indian curry recipe. This is the type of curry that’s made in Indian households everyday, at least in North India. The curries you eat in Indian restaurants, well those are made and relished on special occasions. 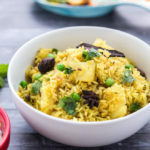 Basic Indian food is very simple, straight forward and fuss free just like this easy Aloo Matar. 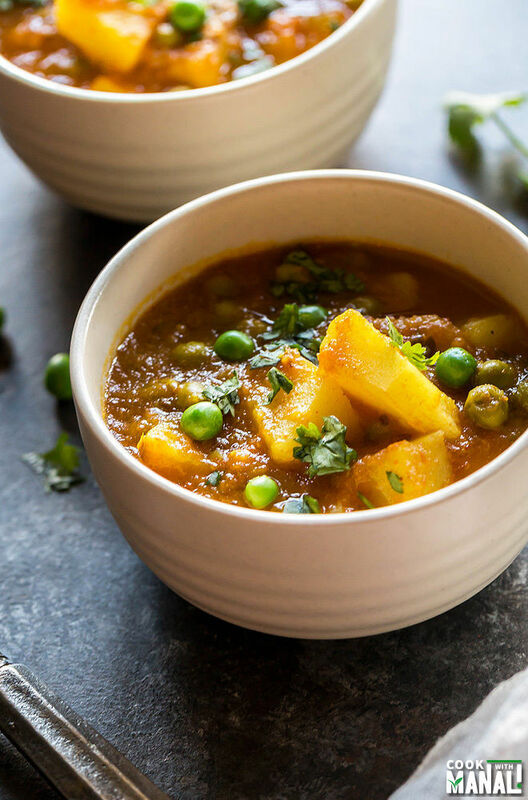 Aloo=Potatoes and Matar=Green Peas so this is a potato and green peas curry and like most Indian curries, this is vegan too. We cook potatoes with everything, from beans to gobi (cauliflower) to spinach to so much more that I have not shared on the blog. 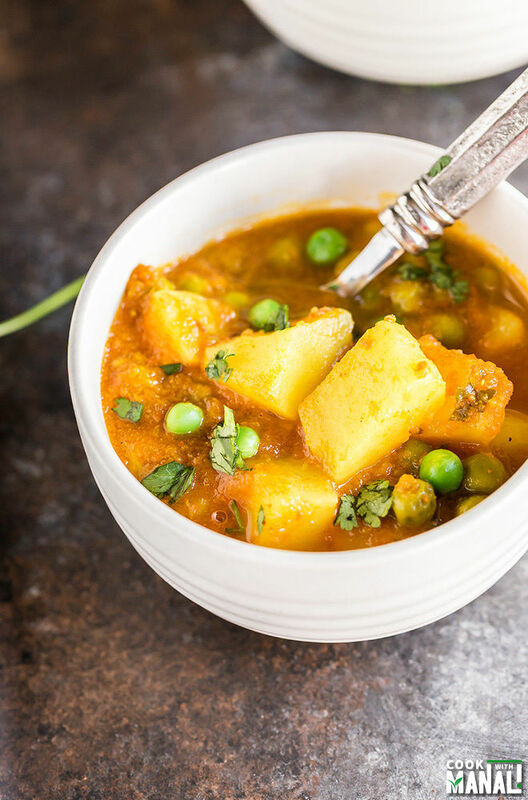 Aloo Matar is usually made during winters using fresh peas. I have obviously used frozen peas here because it’s not everyday that I can find fresh green peas here! This recipe is for those who are new to Indian cooking or for those who are looking for quick and easy recipes. Aloo Matar can me made dry (without adding any water) or with gravy (with water). I like both but I remember mom always made the one with gravy for dinner so I am sharing the same with you guys today. I used boiled potatoes in this recipe to cut short the cooking process. It makes the recipe so much simpler. Once you have the potatoes boiled, you need only 15 minutes to make this. The only time this recipe needs is the time taken to cook the tomatoes. Remember to cook it really well, around 10-12 minutes. Heat oil in pan on medium heat. Add cumin seeds and let them crackle. Then add ginger garlic paste and cook for 1-2 minute till the raw smell goes away. Add the pureed tomatoes. Add little salt, give a stir and cover and cook on medium heat for 5 minutes. Remove cover and add turmeric powder, coriander powder, garam masala, red chili powder. Add more salt as required at this point. Cover and cook for another 5 minutes. After the tomatoes have cooked for more than 10 minutes, add 2 cups water. Let it all come to a boil and then add cubed boiled potatoes and green peas to it. I have used frozen peas here which I put it warm water for 10 minutes before adding to the curry. Cover the pan and let it simmer for 3-4 minutes. Add chopped cilantro and mix. Serve aloo matar with any bread of your choice. It’s also great with plain rice. * Add less water or no water for a dry aloo matar without any curry. 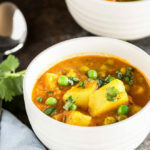 Spicy potato and green peas curry. Aloo Matar is best enjoyed with rice or any Indian bread. Vegan and gluten-free! Heat oil in pan on medium heat. Add cumin seeds and let them crackle. Then add ginger garlic paste and cook for 1-2 minute till the raw smell goes away. Remove cover and add turmeric powder, coriander powder, garam masala, red chili powder. Adjust spice levels to taste. Add more salt as required at this point. Cover and cook for another 5 minutes. Serve aloo matar with any bread of your choice. It's also great with plain rice. I love the simple ingredients and wonderful flavour here, Manali. I love how simple this recipe is. 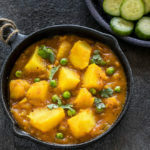 I love potato curry, and it’s a nice healthy budget friendly meal too. Wow this looks amazing Manali! 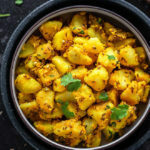 I love aloo matar and this sounds so delicious! There’s nothing I love more than potato curry! Yum! Thanks Annie! Your recipe looked fantastic! Sometimes easy recipe can be the hardest! This looks fantastic, Manali! I love the flavors in here, especially with the potatoes! I’m sure my family will love this dish! Do you know how many cups of tomato purée are needed for this dish? I am not exactly sure Megan, but maybe around 3/4 cup fresh tomato puree? This looks like a super easy and super comforting meal, Manali! Perfect for an easy weeknight meal! Thanks David! It’s indeed very comforting! I had this for the first time this past weekend at a restaurant we frequent and I loved it! I can’t wait to try your version. I know it’s going to be even better homemade! I hope you give it a try! Thanks Jen! Oh yum! 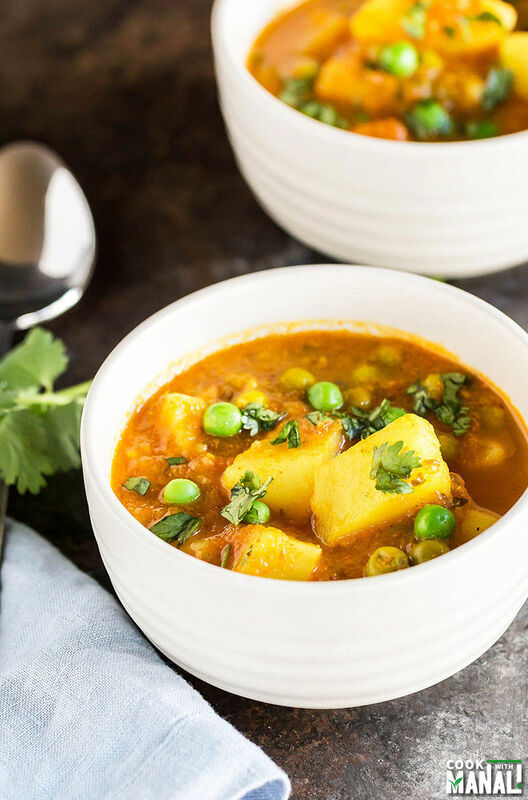 This is one of my favorite Indian dishes…love anything with potatoes! Can’t wait to try your version! Sometimes the easiest recipes are the best and should be shared! I absolutely love potatoes and peas, so this dish sounds perfect to me! You had me at spicy potatoes! This looks absolutely delicious, Manali! And I love how quick and easy this is to throw together! Cheers! Love this dish! Looks beautiful! Pinning to try it! This looks SO great Manali!! I love the spicy potatoes!! I added 3 cardamom pods and a 1/2 teaspoon of mustard seed when I heated the cumin seed and boiled the potatoes with a whole jalapeno. Sooooo good! Tonight I decided to make aloo matar with chickpeas added, so I googled aloo matar for some spice guidelines. I tend to go crazy and add a little bit of everything, so I wanted a more authentic flavor. Your recipe popped up and it was perfect! The only changes I made were: canned crushed tomatoes because I didn’t have fresh, using powdered ginger in the tomatoes because I didn’t have fresh. Everything was perfect and it cooked so much faster than my curries usually do on the stove! To go with the curry I made a mix of 2/3 steamed basmati rice and 1/3 quinoa. Since I’m bored with my own curries now and your recipe was so great I’ll look forward to making many more! Thank you for such a great recipe, keep up the good work!